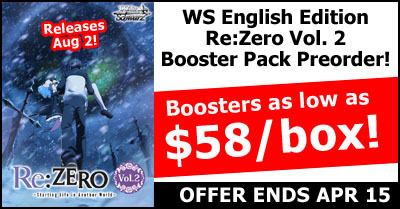 This is a PRE-PAID LIMITED pre-order for the WeiB Schwarz Re:Zero Vol.2 English Edition Booster. We are offering low pre-order prices on sets of 4, 8 or 16 boxes ordered before our deadline with the distributor. All booster boxes will be from the same carton. If you order a set of 4 and a set of 8 we will do our best to make sure those are from the same carton as well. If you submit multiple orders please make a note in your later order so we can attempt to pull from the same carton. Pre-order period for this item ends at 10 PM on Monday, April 15th. Release date is August 2 2019. Pre-Orders cannot be cancelled. Card set release date, details and images are subject to change before release as are number of cards/foils/signatures/etc in the set. English text.